When I ask the students what we should do to the sap to ready it for our pancakes, many of them suggest we add sugar or honey. They light up with an expression of “Oooh, yeah…” when I tell them we don’t need to add anything, we need to remove the excess water – using evaporation. We gather around the fire to witness the sap as it boils in an evaporating pan. The finished syrup will have a density of 66 on the Brix scale – or 66% sucrose. The students sip the boiled sap long before it becomes syrup and can already taste the difference. We then guide the students through a hands-on historical perspective on maple syruping as they reenact pioneer times. They carry buckets of sap with a shoulder yoke, and cut wood for the fire with a two-person saw. They learn how Native Americans made syrup and maple sugar long before pioneers, and listen wide-eyed to the legend of a great Indian hunter whose wife discovered maple syrup through a happy accident wherein she cooks the evening meal in sap instead of water. They then learn the science and math of maple syruping by using a hydrometer to measure the sugar content in various saps (sugar maple, silver maple, and partially boiled), and they calculate the number of gallons of sap it takes to make a pint of pure maple syrup (the answer is 4). If you want to continue your own dive into the science, math, and history of maple syruping, there’s a wealth of information online, including here, here, and here – along with the below video created by Canadian homesteaders who make the tiniest batch of backyard syrup. A Sugar maple tree must be about 40 years old and 12 inches in diameter before it can be tapped for making maple syrup. The maple syruping season requires a very specific weather pattern: warm sunny days, (above 40 degrees F), and frosty nights, (20-25 degrees F) for sap flow. On average, it takes 40 gallons of sap to make one gallon of syrup. Because of the above factors and the tremendous amount of work that goes into cooking sap into syrup, the price of pure maple syrup significantly outweighs that of “pancake syrup” which is primarily corn syrup. A quick check at my local grocer confirms 12 ounces of maple syrup produced in Wisconsin sells for $7.59 while the pancake syrup is $1.59. According to the National Agricultural Statistic Service, the US produced about 4.1 million gallons of maple syrup in 2018. The price per gallon earned by producers has fluctuated between $37.20 and $32.20 over the past several years. Some cultures skip the cooking process and simply drink the sap. It is believed to have tremendous health benefits. Check out this new (and controversial?) method of collection sap from Science Friday. Learn about traditional maple syruping from Nature Net member site, MacKenzie Center, at their April 6th Maple Syrup Festival or at Aldo Leopold Nature Center’s Mini Maple Fest on March 23rd, 2019. Visit our Nature Net friends, Riveredge Nature Center near Milwaukee, for Maple Sugarin’ Festival March 23rd, 2019. Visit a local sugarbush and learn about our local producers. Welcome spring by decorating pots and starting seeds for your garden at the Madison Children’s Museum! You and your kids can learn more about plant and seed cycles and what it takes to cultivate plants. Wisconsin’s Ojibwe people call this time of year Ziigwan – when the waters melt and the sap begins to flow. Click at left to preview a short video designed for classrooms that shares the traditional ways of maple syruping in this region. This video and others like it can be found on the “Wisconsin First Nations: American Indian Studies in Wisconsin” website. Created by the Wisconsin Department of Public Instruction’s American Indian Studies, along with Wisconsin Public Television and the UW School of Education, the site “provides educators and pre-service teachers accurate and authentic educational materials for teaching about the American Indian Nations of Wisconsin.” In addition to videos, it offers a collection of resources including professional development opportunities, correlating lesson plans, and area exemplars. PS: check out this great story of 6th graders in New York who spent the day making syrup at their local sugarbush. I like to leave students knowing they, too, can tap trees for syrup-making provided they have just a bit of knowledge on tree identification, specifically in the winter. We start by looking at the trees’ branching pattern. Only a few native Wisconsin trees have stems that grow straight across from each other on the branch. We call this opposite branching, as opposed to alternate branching which is staggered left, right along the branch. The four Wisconsin trees that grow with opposite branching are maple, ash, dogwood, and horse chestnut. We remember this with the acronym “MADHorse.” Horse chestnut prefers more southern climates and is not very common here, and Dogwood is most often a red-branched shrub, so really, we only need to distinguish between maple and ash. During the winter and early spring, when there are no leaves to aid in identification, we use the trees’ buds as a species indicator. 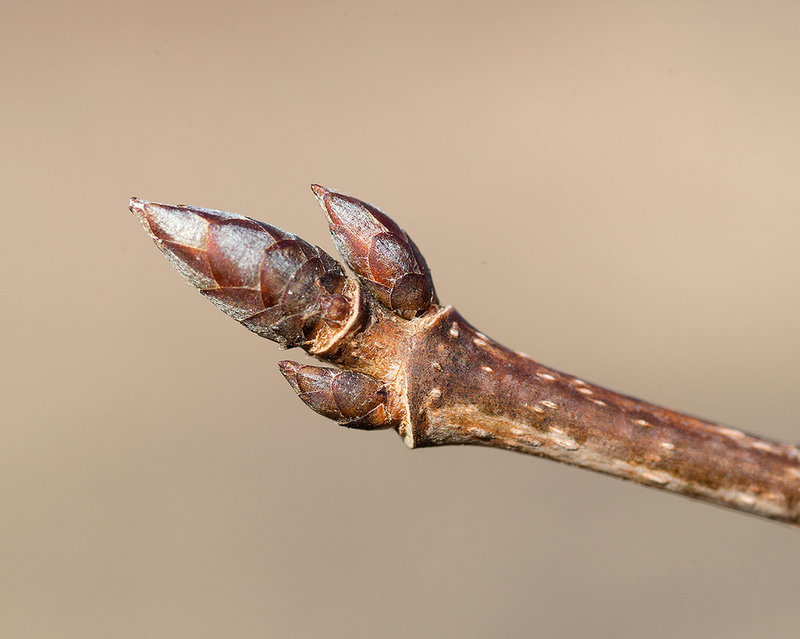 The buds of sugar maples are distinctly sharp and brown-colored (the kids liken them to a pencil lead). The picture at the top left is the sugar maple. The buds of other maples and the ash tree have recognizably different characteristics – see above left (click to enlarge). Some use the bark as an additional indicator: the bark of the sugar maple is light brownish-grey with longitudinal plates or strips, whereas ash tree bark has diamond-shaped ridges.